Hickory Nut Falls flows on Fall Creek through the Hickory Nut Gorge, and is part of Chimney Rock Park, a park that was privately owned until May 2007, when the State of North Carolina completed the purchase of the park. Chimney Rock Park and the Hickory Nut Gorge are being developed into a state park. Prior to 2007, the park and the falls was owned by the Morse family, and was widely known to Southerners for over 100 years. 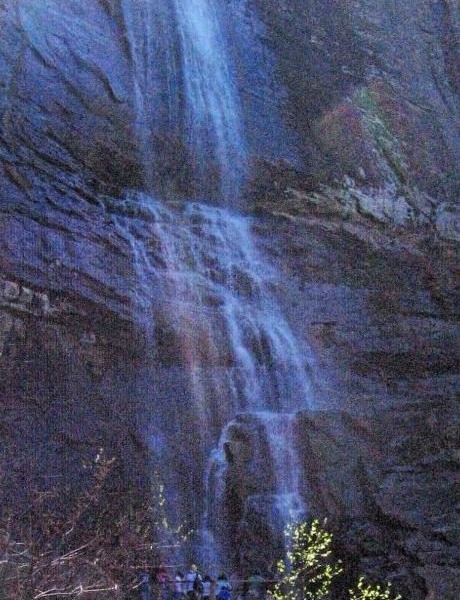 National attention came to the park and the falls when it was featured in the 1992 film The Last of the Mohicans. The park was heavily featured at the end, and the final fight scene between Chingachgook and Magua was filmed at the brink of the falls.